BlogAdda recently mailed me, letting me know about their latest contest in association with Britannica. 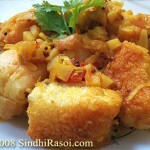 I expressed my wish to contribute and got selected to share an article regarding Sindhi Cuisine. So here I am sharing the article ‘Unfeigned-ly Sindhi’, that was published in ‘Food and Nightlife’ magazine in July 2010 Edition. I am Thankful to the Magazine, to Neha, who gave an opportunity to write for the magazine and yes, of course to Sumit Goyal (Editor), who gave me the permission to re-share this article on my blog. Thank you guys, you are rocking! Sindhi, a culture having its roots in Sindh (Now in Pakistan), proudly belongs to ancient Indus valley civilization as discovered from the Moen-jo-Daro excavation. The culture rich, the art unbeatable, the Sufi music unmatched and the Cuisine simply invincible, at least for true blooded Sindhis! 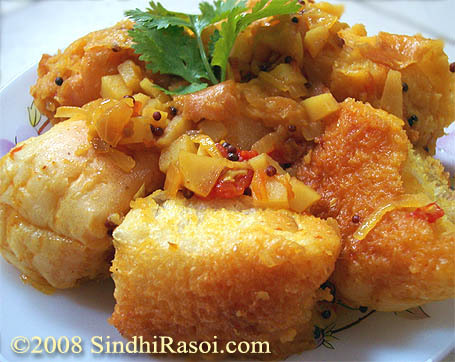 Sindhi Cuisine, apart from having unique flavors of its own, have the unmistakable mark of other dynasties like Mughals, Arabs, Soomras etc that influenced Sindhi cuisine while they ruled the Province. The mighty Koftas, the scrumptious Biryanis, amazing Gosht (meat) curries, got infused in Sindhi cuisine during that era. Post partition in 1947, Hindu Sindhis got scattered around the world, and since then, a long battle to keep ourselves rooted to our culture while simultaneously absorbing the culture of our surroundings, is being fought. 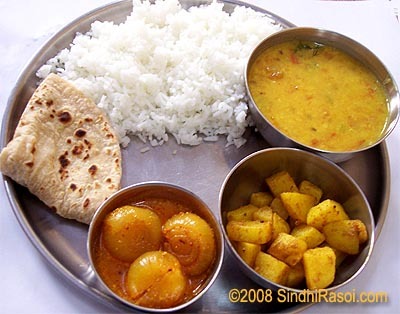 As various other cuisines of India, Sindhi cuisine is also a vibrant one, sizzling and dazzling with lots of flavors, a wonderful amalgamation of delish sweets, perfectly tangy curries, mildly flavored gravies, rich and wholesome biryanis, wide array of seasonal vegetables, awesome variety of flat breads, and not to forget the world famous Sindhi Papad and Sindhi pickles. To begin with, a royal breakfast preferred by Sindhis, ought to be The Dal Pakwan, the crisp fried Maida flatbreads, served with simple Chanadal, garnished with chutney and chopped onion. 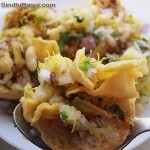 Apart from this, Bori (Kutti or crushed koki tempered with hot oil, and sweetened with sugar), Sindhi Koki, a wholewheat flour flat bread, kneaded with onion, chillies, dried pomegranate seeds, cumin and a generous amount of oil, double cooked on griddle, or Lolo (sweet flatbread) Dodo (Flatbread with millet flour, jowar, bajra etc), stuffed parathas with Curd are most popular. 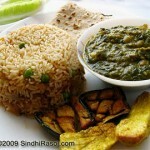 Juar (jowar/sorghum) Jo Baht and Bhaat (cracked wheat) porridge are favorites of elders of the family. 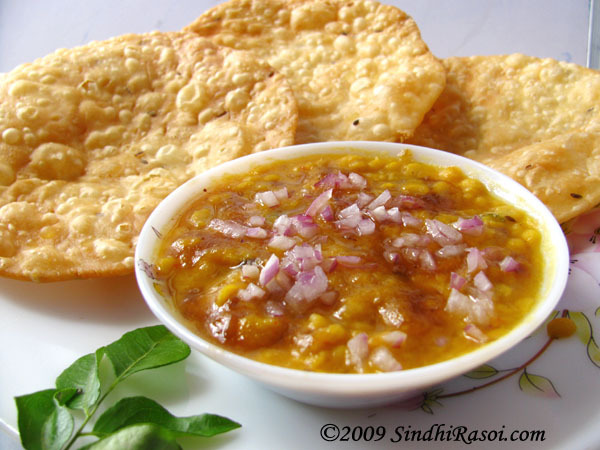 And bread dunked in chickpea curry called Chola dhabhala or the two lentils cooked together called Dal moong are still the most sought after breakfast in many Sindhi families. 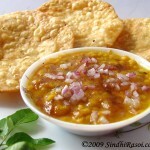 Sindhis love simple Dal chaawal- subzi -roti combo. 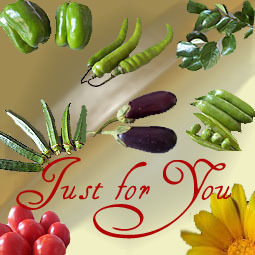 They have some popular style of cooking like Daagh (curry with browned onions), Seyal (cooking food with onions or ginger garlic as base, with little or no water), Tamatey mein (In tomato gravy), saye masaley mein (with Green base, that of coriander leaves and fresh garlic) and Dhaas vegetables (Stuffed vegetables like Okra, Apple gourds, Capsicum etc).Though seasonal vegetables, and plenty of lentils /pulses, are included in daily cooking, but when fresh vegetables are unavailable, Sindhis tend to make use of besan, and hence Chilra (Gramflour savory pancakes), Chilra kadhi, Aani ji bhaji (Besan dumplings in onion tomato base) are immensely popular. 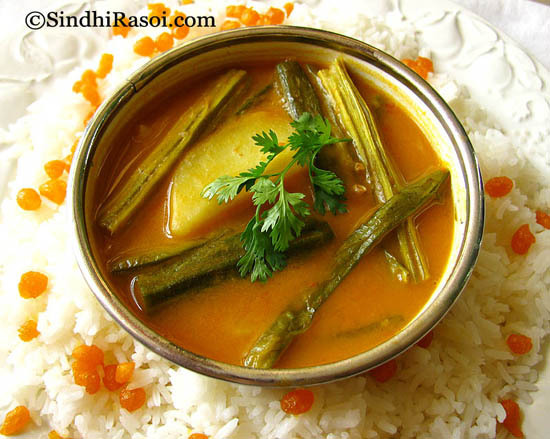 And not to forget a Sindhi specialty called Sindhi Kadhi , which is a tangy tamarind and gram flour based curry, flavored with some spices and Vakhar like cluster beans, okra, drumsticks etc. 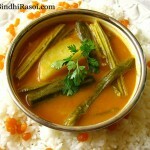 This is again generally made for guests and is served with hot plain steamed white rice and sweet boondi. 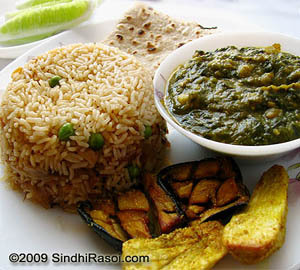 Amritsari wadis cooked along with potatoes, is one spicy curry you cannot afford to miss, and so is Sindhi Saibahji, the yummiest concoction of spinach with fenugreek leaves, sorrel leaves, beans, potatoes, carrot, eggplant, okra, chana dal etc. Though now paneer rules the menu of marriage buffets and festival food, there was a time when Bhee (bhein) i.e Lotus stem hold the Numero Uno position. During marriage ceremonies decades back, relatives and neighbors were offered the Bheepatata and Degh Waara chaanwara. Huge Iron or aluminum pots or containers were kept in open spaces, on logs of wood, or coal (sighri) or stove, and a generous quantity of rice and curry was cooked on it. It was called Degh. A spicy curry of lotus stem, potato, peas, cooked in the base of onions, tomatoes and eggplants, when served with simple pulav, will make you slave of Sindhi degh. Even today this curry is cooked and distributed at Langars in various temples, on religious occasions. 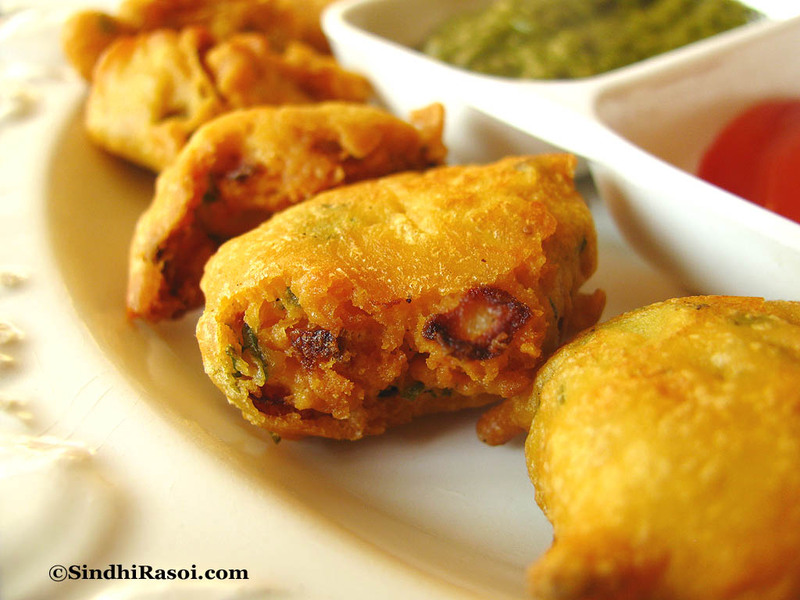 Sindhi Sanna Pakoda (Double fried Gram flour fritters) are famous as most crispy snacks, while Alu tikki, Batan papdi (A Sindhi chaat), mirchi Pakora, bhein tikki, Spinach Pakora, are other guilty pleasures. 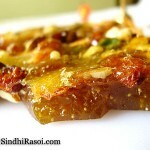 Sindhi Papad has a unique taste, neither too spicy nor bland…just perfect. And so are the pickles…the regular oil based as well as mustard seeds and water based pickles called as Paarianh waari Khatairn have many loyal followers. 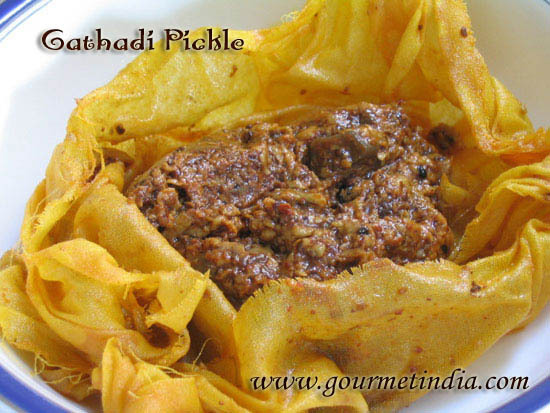 Yet another typical Sindhi style pickle is Kadhookas (grated), pickle made from raw shredded mangoes, seasoned with salt, turmeric, red chillies, nigella seeds, cloves of garlic, mixed and lumps of these mixture are tied in small white muslin cloth gathadis (like dumplings), pickled and enjoyed later. 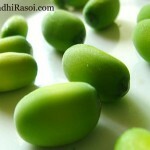 It’s called Gathadi aka Bheendi. 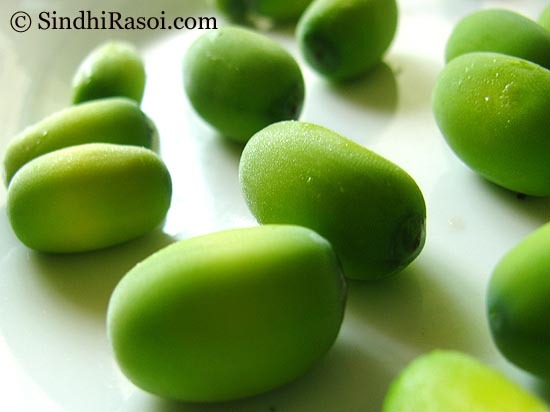 Summers are spend pickling turnips, onions, carrots, chillies, lemons, raw mangoes etc. While sweet pickles like raw mango Muraba, Awran jo Murbo (Awla/gooseberry) and grated mango pickles are the hot favorites amongst Sindhis. 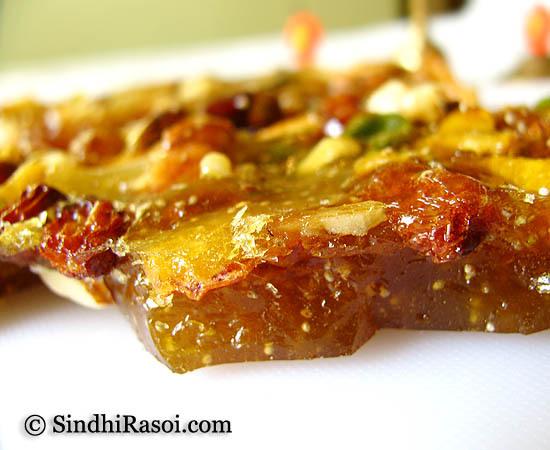 Festivals like Chetichand, Diwali, Holi, Akhand Teej,Thadree are celebrated with typical Sindhi sweets like, Tosha, Praghuree, Geear, Khuskhus halwa (Seero), chabhu Halwo etc. while sherbet and Thaadal (Thandai) are most popular beverages. 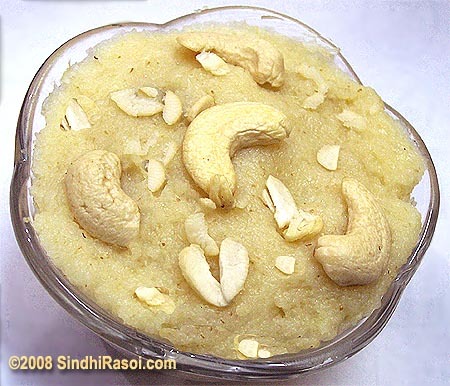 And to wind up, Sindhis satisfy their sweet cravings with Gaajar halwa (Gajru’n jo seero),Varo, Maajun, Mohanthal, Gulabjamun, Rabri , dried grated coconut mithai (Narel ji mithai), Singhar (Sev) Mithai, Falooda icecream etc. 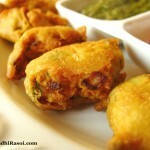 Probably, only places that you could still enjoy Sindhi food are few eateries like Kailash parbat and Bhagat Tarachand , or else on the streets of Sindhi dominated areas like Ulhasnagar, Chembur, Bhopal to name the few.The vendors selling dal pakwan, Sindhi Patties with chola and Dal moong are common sights at such places. 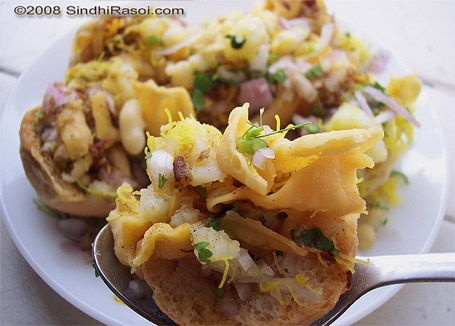 Sadly the trend of fast food and exposure to national and international cuisine is drifting many youngsters away from the lovely Sindhi cuisine. The ‘Chips’ and ‘ french fries’ generation hardly cares for Sindhi Kheecha and papad. The biscuits and cookies overshadowed the humble Dal Nakul that was initially offered to the guests. Mock tails and canned juices pushed into the corner, the home made Rose sherbet, Chandan (sandalwood) sherbet.The artificially colored, branded Mithai, killed the trend of sharing Mazoon, Khus khus jo seero, ladoo etc with near and dear ones. Packaged junk snacks diverted kids from the good old, Pabhoree (fresh lotus seeds), Jamun (berries), Saawa phota (fresh green peas), Dhadhri (tiny fresh green pods ) etc which used to be the after school time snacks for the kids, eons ago. A must read for New Generation. Sindhi dishes dekhkar parhkar man khush ho gaya .. Very well put. Thorough. 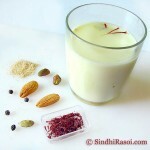 Has covered most of the items but would still like to add many exotic preparations for which any sindhi would die for.